Martini glasses emblazoned with the words “Mommy Juice.” Hundreds of people lined up in the bitter cold for a Christmas-themed bar. Cocktails, including one at $8,500 a pop, made with vintage liqueurs. It may seem like we’re living in the golden age of cocktails — yet 30 percent of Americans don’t indulge at all, while another 30 percent have only two alcoholic drinks per week. 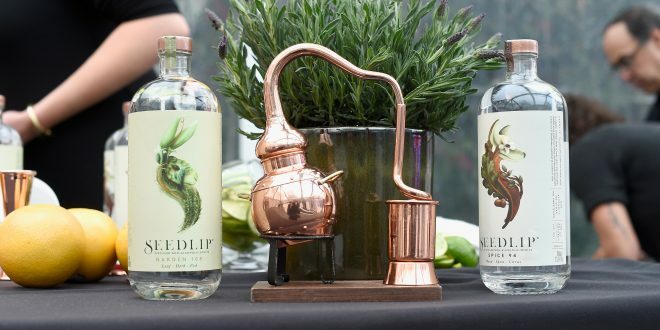 So when Wiznitzer, a past president of the U.S. Bartender’s Guild, heard about Seedlip Distilled Non-Alcoholic Spirits, she was, naturally, a little skeptical. “The idea that you could craft a product that could act in the capacity of alcohol without having alcoholic content seemed contradictory,” Wiznitzer says. Zero-proof brands such as Seedlip, Ceder’s, Herbie, Whissen and Strykk are aiming to disrupt the way we view traditional liquor-focused cocktails. Indeed, Joanna Carpenter, a self-described “semi-sober” bar director at Town Stages in Manhattan, says that flavor, not alcohol content, is the true driver behind a great cocktail. Curious Elixirs, a line of bottled zero-proof cocktails, was dreamt up by former bar owner John Wiseman after a night when he says he consumed some 20 alcoholic drinks — and suffered no ill effects the next day. “I was trying to chase the dragon,” he says, “and that’s when I realized it was a problem.” Coming up with nonalcoholic options to some of his favorite cocktails, such as a classic Negroni or a spicy cross between a Dark ‘n’ Stormy and a margarita, Wiseman set out to craft alternatives that were less sweet, low-calorie and easy drinking. That’s where a well-crafted zero-proof cocktail comes in — and it might cost close to the same as the alcohol-fueled items on the same menu, because of the labor and the pricier ingredients being used, whether it’s exotic fruits or products like Seedlip, which retails for about the same price as many traditional liquor brands.